For family bikes in the UK, make us your premier choice. We are the only stockist of the Bellabike in the UK, an impressive family bike for up to 4 children/babies. We also stock the Zigo leader, which is a lightweight bicycle with an integrated child carrier that converts into a stroller, a jogger, a bicycle trailer and an urban cycle. One bike, 4 functions. Bakfiets.nl cargo bike and trike. Genuine quality and smooth ride. We also stock the ultimate family tandem, the Circe Tandem, which converts in seconds to carry either a child or another adult in the back seat position. Or – want the children in front of you on a tandem? This is now possible with the ONDERWATER tandem. It can even take 2 children cycling and 1 adult. Or if you prefer a bicycle trailer, we stock these too, including the new Weehoo igo trailer. Maybe an elegant traditional Dutch 2 wheeled bike to transport your children is more your style. Take a look at our that are designed specifically for this purpose. Models include the Workcycles FR8 and the BSP Motherbike. Call now to arrange an appointment to see and try all the innovative cycling possibilities for your family. 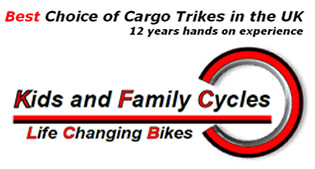 For a tandem bike in Dorset contact Kids and Family Cycles Ltd. We are based in Christchurch but we operate nationally. We have been keen tandem and triplet riders for over 20 years and are happy to share our tandem and triplet family riding experiences with you. The Circe Tandem bike really is the ultimate family tandem. It converts smoothly and swiftly from being two adults riding to an adult and a child. You can even convert the back seat to carry up to two child bike seats. Take a look at our website to see the many different seating arrangements, you’ll be impressed. This is a bike that changes as your family’s cycling needs change. Great value too. You can get in touch with us by phoning us or alternatively you can use the ‘Contact us’ page. We look forward to hearing from you soon. Get in touch with Kids and Family Cycles Ltd, for a tandem bike or a family bike in Dorset.